"Hey DT, you guys post too many interesting cars offered for low prices"...said nobody ever. At least, we haven't gotten that complaint yet (we have been accused of posting too many Volvos and, once, of sneaking into someones garage to take pictures of his car for sale...true story). What is interesting might be a moving target, and the "low price" bogey is an ever evolving landscape of supply-versus-demand...but I think the basic thought behind this website is: you don't need to be a millionaire to drive something that is interesting, fun, and unique. 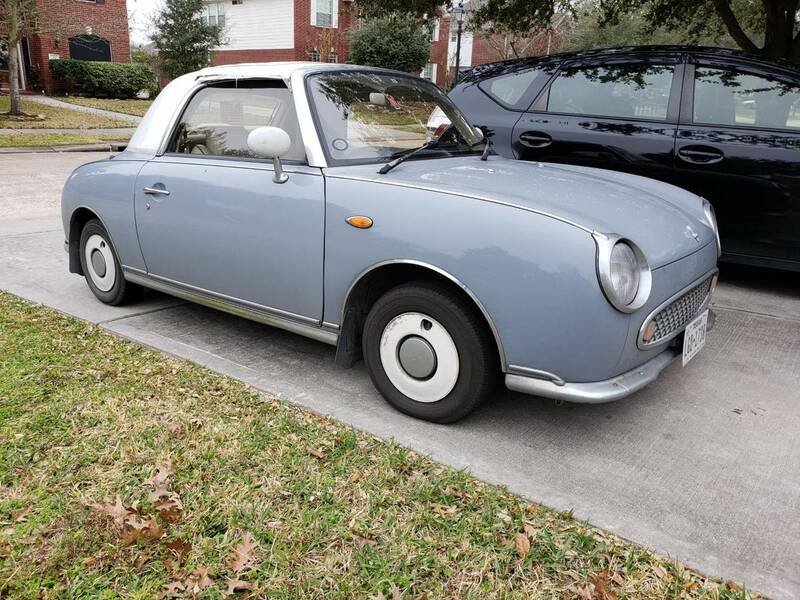 Like this 1991 Nissan Figaro offered for $6900 in Houston, TX via craigslist. Tip from FuelTruck. 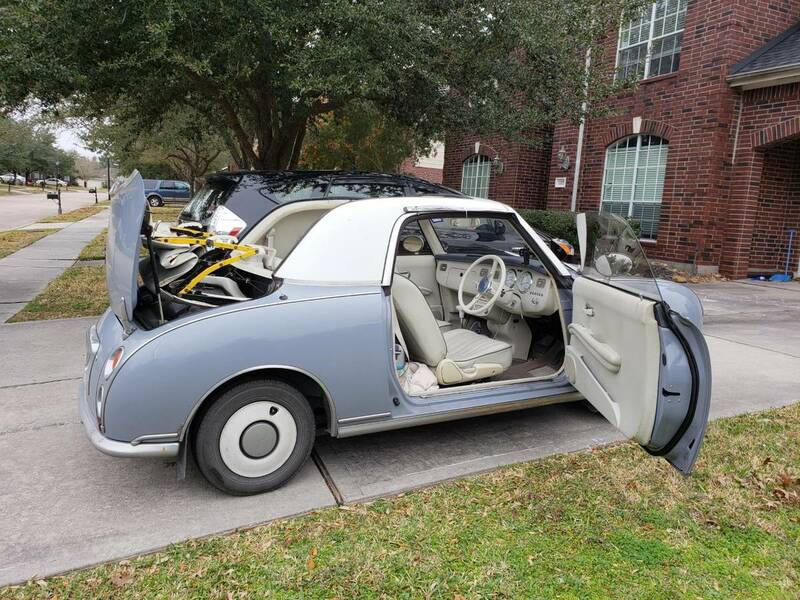 Selling my rare Nissan Figaro import convertible. It has about 60,000 miles and is in great condition. It has cold AC and the top opens and closes fine. No leaks and leather seats in great condition - no tears or cracks. 1 liter turbo charged engine! It has some problems that are normal for a 27 year old car. The bumpers have rust and need a good re-chrome. There are 3 small spots where rust needs to be taken care of. One wheel cover fell off - but I ordered a full set of 4 that will go with it. With a little time and TLC - this car in excellent condition can be worth $$$. Cash only, local sales, no trades. I don't need help selling and I don't have time for low ballers. I am leaving for Japan next year, so I will buy another car in Japan. Taking request for JDM in Japan too. Text me or email me - I'll contact you. No scams - I've seen them all! If I could somehow pull this off and not look ridiculous, I would. At least for a few months, just to file it in the Well, That Was Interesting folder in life’s mental cabinet. Not everything is big in Texas. Looks like a lot of fun. Thank you for introducing "Narcotizing Waft of Affordability" into my personal lexicon. Thank Doctordel -- it is his creation!! Again, thanks for the props, BIR. That particular odor you mention seems to (often) precede the inevitable sour tang of regrettable reality, once hands have been shook and money changed hands. But, as Clark Griswald taught us: it’s all part of the experience, honey. Needs more Hayabusa. Pretty sure this could be reliably positioned between the axles of most bro rigs down here in SoFla, and that’s at highway speeds. I’d wager the over/under at 2.5 weeks, before it got flattened by a 100k hi boy with wheel well LEDs and chartreuse springs, driven by a 17y/o on his way to court ordered community service.